After a very bumpy 2 hour boat journey, I arrived at Caye Caulker. I remember being so excited on the boat ride over that I couldn't stop smiling and I was not at all disappointed. This is a gorgeous, little Island just off the coast of Belize. The motto of the Island is "Go Slow" and the locals really embrace this way of life. The guidebooks describe Caye Caulker as having "a barefoot, beer drinking, good eatin', hammock-swinging lifestyle" and I couldn't describe it any better myself. If I'm gushing a little bit it's because I really LOVE this Island! The locals are all big, dreadlock wearing Rastafarians who speak a type of Kriol, which sounds more Jamaican than anything and the island has this really relaxed, Caribbean vibe to it. There are no cars on the island, it's so small that they aren't really needed and you can walk from one end to the other in about 30min. There are a few golf carts, which are used as the local taxi service, but that's about it. A lot of people just walk around barefoot all the time, as the roads are basically just sandy lanes. I stayed at Yuma's house, which is one of only two hostels on the island and it was very nice and clean, which was such a welcomed change. Suzanne is a lovely, German woman who owns and runs the hostel, but oh my god is she ever strict! She has an abundance of rules that the hostel goer's must live by. Her demeanour is sometimes off putting and some people found her very offensive, but I found her hilarious! She didn't even realise when she was being rude to people, it was just her way, but it turned out to be a constant source of entertainment for most of us staying there. At Yuma's I ran into Alfonso, who I had met a few days earlier in Chetumel, Mexico. He was there to meet his friend Albert from Canada. I've never met soo many Canadians in one place before outside of Canada. This Island was full of them and I could hear my own accent getting more Canadian by the day. These two were really nice, funny guys and always good company. Albert had been on the island for almost a week, so he quickly filled us in on what was what. Basically, the place is soo small that everyone does the same thing every day. If you're not heading off on a snorkel or diving trip then you go to "The Split" during the day. 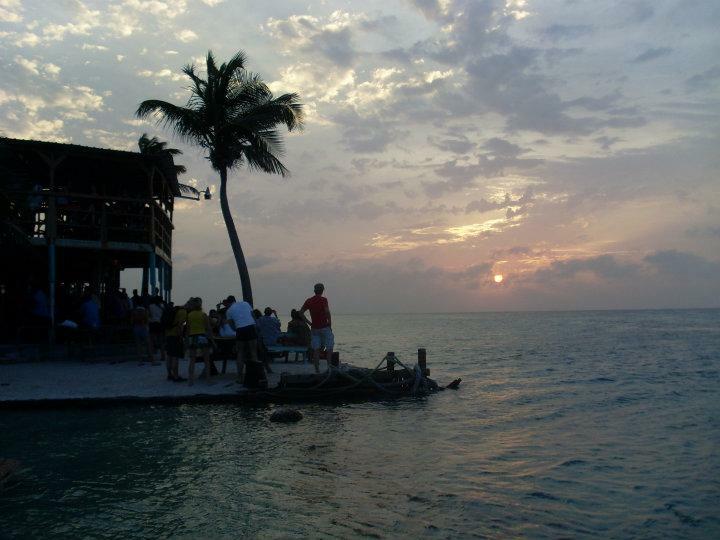 Caye Caulker is actually 2 islands, since Hurricane Hattie split the island in two in 1961. Hattie actually demolished almost half of Belize. At "The Split" you swim, sunbath, have a few drinks, meet tons of people and just generally hang out by the Lazy Lizard Bar waiting for "Happy Hour" (4-8pm), when it's 2 for 1 rum cocktails! Turns out I really like rum and just never knew it! At night everyone heads to the I&I Reggae Bar from 10-12pm. Here the local Rasta's chat up all the female tourists. If you have low self-esteem, then this is definitely the island for you. It doesn't matter what size or shape you are or what you look like, you could have a second head growing out of your neck and you would still get hit on constantly. The locals never get tired of shouting out "hey Bonita" and "pretty lady" every time you walk down the street. It's a nice little boost for your ego every day! I&I's has a cool little roof terrace with swings for seats and a really chilled out atmosphere. However, the roof terrace closes at 11pm and you are forced downstairs into the main bar, which is covered in glow in the dark graffiti and illuminated by an abundance of black lights. They have a DJ on every night that plays the worst music I have ever heard. It's not reggae as you and I know it; it's Belize's own style of "Punta-rock", which seemed to be really harsh reggae mixed with really hard rap. It sucked and it hurt to listen to, but once in a while they would throw in a Bob Marley number for good measure. At midnight everyone leaves I&I's and heads over to Oceanside nightclub, as it's the only place still open on the Island. This is a weird and wonderful little place with tacky strobe lights, a sandbox for a floor and picnic tables for seats. The dance floor is tiny and includes a stripper pole for some unknown reason. Although, all the drunken tourists seem to enjoy using it to make asses out of themselves (no, I did not succumb to the stripper pole! ), whilst the DJ constantly churns out bad 90's dance music. This was a seriously entertaining little place. So to recap, almost every day is a mixture of "The split", I&I's and Oceanside with a trip to "Pirates" or "Enjoy bar" for dinner (amazing food) and an afternoon nap in a hammock thrown in to break up the day! Relaxation and good times is the name of the game here. I cannot stress how laid back this Island is, it's practically in a coma! The water here is crystal clear and the world's second largest coral reef is right on your doorstep, so loads of people come here to dive and snorkel. The shark infested, blue hole is a 2 hour boat ride away and also attracts a lot of divers. During my stay here I took a snorkel trip out to the reef and it totally exceeded all my expectations. The boat took us to 3 different locations, "The Coral Garden", "Shark-Ray Alley" and "The North Channel" where we saw all kinds of tropical fish, sea turtles, sting-rays, nurse sharks, tons of different coral and a heap of other cool stuff. The water is soo clear that you can see everything perfectly. Shark-Ray Alley was by far the most amazing part of the trip. The sharks and rays come right up to you, but thankfully they are totally harmless! Alfonso and I hired bikes one day and cycled around the Island. This was the first day I had seen him do anything other than drink and sleep in hammocks! Unfortunately, after the airstrip and the world's smallest airport, the cycle path (and I use the term "cycle path" loosely) leads you directly into mangroves. At this point I realised we were being eaten alive by mosquitos and we quickly retreated the way we came. For some unknown reason mosquitos love me and I had been savagely attacked by them the whole way through Mexico, so I wasn't too surprised when I counted a whopping 34 bites! However, I was shocked to find out that Alfonso only had 2 bites!!! How is that possible when we were right next to each other the whole time? While on the Island I met a lot of really nice people. There was Dan from Wales & Dan from Manchester. My roommates, Darrell from California, Jordana from Canada, Andrew from Alabama (who I had already met once before in Chetumel) and I were all single travellers, so we all hung out together and had a laugh. We were joined by 2 other Canadians (Chris and possibly Emily? ), a French girl (whose name I have already forgotten) and Daniel from London. We ended up having a few quiet nights in at Yuma's "AKA RUM NIGHT!!" and they were all a lot of fun and just genuinely nice people. This Island is a little slice of paradise, but once in while things happen that remind you that you are still in Belize. During my stay there were two scuba divers killed due to strong currents and there was also a shooting on the island. Turned out a 17 year old kid had stolen a cop's gun and shot the cop as revenge for the cop previously arresting him. So boat loads of cops arrived, all with mega automatic weapons and a man hunt was undertaken to find the kid. You would think on an island this small it would be simple, but it took 2 full days before they finally found and arrested him. Oh yeah, the cop survived as well, no permanent damage. It was all very bizarre! So after a week of good times with some awesome people it was time for me to head off to my next destination. Although this was an unbelievable place, I think you could only stay here for so long before you would get bored (or die from liver failure), so I was glad to leave still amazed and totally in love with this little Island. You betta Belize it!